Have I ever mentioned that I love using things I already have around my home to help Andrew build developmental and academic skills? Perhaps only a hundred times but it is so true! I also like to pass on ideas to you that are simple to put together and also easy to adapt to various skill levels. 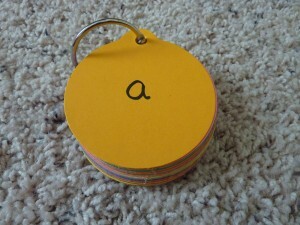 Sight word cards on a ring. I had picked up this colorful pack of round cards that are perfect for creating flash cards (You could also use index cards or any note paper that you have at home, I would just recommend that it is thick enough so you are not be able to see the word from the other side.). 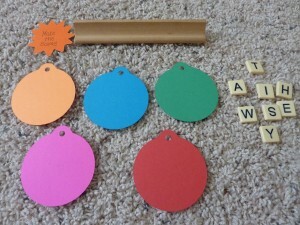 This particular set comes with one of those binder rings to keep them organized and make it easy to flip through them. 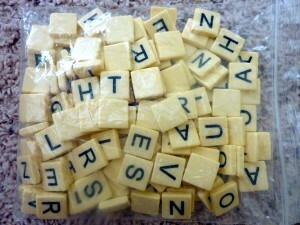 For this activity though, I went through and chose some words to build and took them out of the pack. I flipped them over to make it more of a game, giving him the choice of which card to flip over first and set out the letters he would need to make the words. 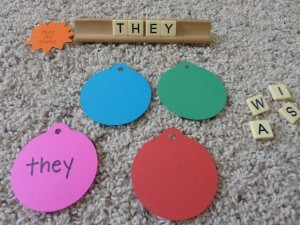 The set up for this only took a few minutes and could be done with basic word families (click here for a list of common word families on EnchantedLearning.com), spelling or Word Study words, thematic or unit study vocabulary words or words that go with a speech sound your child is working on. 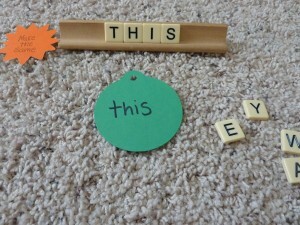 This is such a simple game but gets the child actively involved in putting the letters together to form the word. 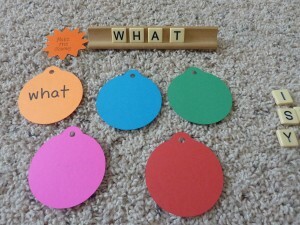 This can help children who are having difficulties with sight words and utilizes all modalities of learning – visual (seeing the word), auditory (hearing the word said out loud) and kinesthetic (putting the letters together to form the word). Flip the card and spell the word. The fact that this is turned into a game and that they have the choice of which card to flip helps to reduce the struggle and frustration that can occur when practicing or building skills that may be more challenging. If your child is ready for more of a challenge, have them choose the card, read the word to them without letting them see it and see if they can put it together. If they get stuck, the card is there to help them correct any errors.